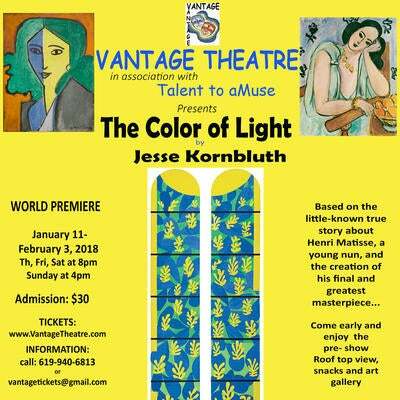 The Color of Light, a world premiere play about Henri Matisse by Jesse Kornbluth, is a visually exciting theatre piece about the power of Art, Spirit and Love. Matisse was the best-loved artist of the 20th century, but this true story — an atheist’s spiritual romance with a young nun — is practically unknown culminating in the creation of his final masterpiece The Chapel at Vence. The Color of Light provides​ ​audiences with a full artful experience; a theatre production,​ pre-theatre talks about Art, the Religious Life; an art gallery for audiences to meander through with bites and beverages; and a beautiful rooftop lounge with a view of the city. Art gallery open one hour pre-show and during intermission.